Norway-based cruise operator Hurtigruten AS has developed its own unique formula for developing cruise talent. The practice is already paying handsome dividends. Fun, luxury, experiences — that’s what cruise operators sell, and by all accounts, it is selling well. With bookings up three years in a row, competition for skills and customers is up. Increasing in frequency, too, are cruise-company launches of the largest floating cities ever. Yet, steaming up alongside for a share of this business are modern day versions of storied coastal steamers building Transatlantic credentials from headquarters in Norway, Italy and elsewhere. Conspicuous among them is recently revamped Hurtigruten AS with a focus on expedition-like adventure, expediting cargoes and “flexible” staff. OSLO—“Qualifications: pleasure craft boating certificate; mariner security certificate; restricted operators certificate,” the Spitzbergen Travel job ad says, adding that the company also prefers “weapons experience, outdoors experience” and experience in and around the remote, polar-bear-filled Spitzbergen archipelago. Applicants are encouraged to call the operations leader for expeditions at the Travel company, a shore-based business of Hurtigruten AS (pronounced Hoorty-rooten). Among other company ads with deadlines expiring in mid-February are calls for payroll experts. A new CEO from the successful airline Norwegian Air Shuttle was brought in just over three years ago. 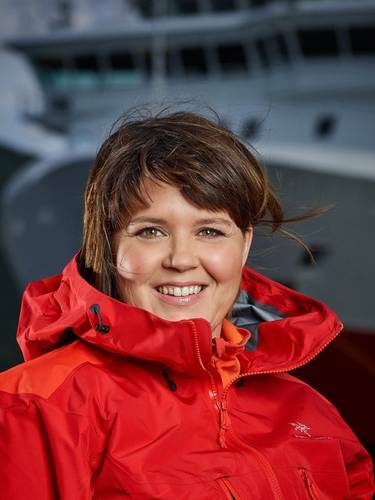 Not long after that came – just in time for 2105’s massive ship overhauls and a needed new crew training regimen – Hurtigruten brought in Senior Vice President, People and Organizational Development, Marit Finnanger. She joined a management team just finishing up a major turnaround, as Hurtigruten went from being a cash-conscious coastal steamer with a mix of older and newer vessels to an upgraded coastal and expedition cruise company divided into Norway and Transatlantic divisions. On the HR side, the soft-spoken but clearly managerial Finnanger says the change in HR focus means from purely manning and regulations to “structural changes” focused on making the seaborne side of the HR organization and its shore-based people development work in tandem. “We established a full HR organization that encompassed the seaborne side to strengthen it by working heavily on developing an organizational culture that would generate strong business results. We involved the whole organization in developing a new set of values that we’ve trained all people globally on,” says Finnanger. 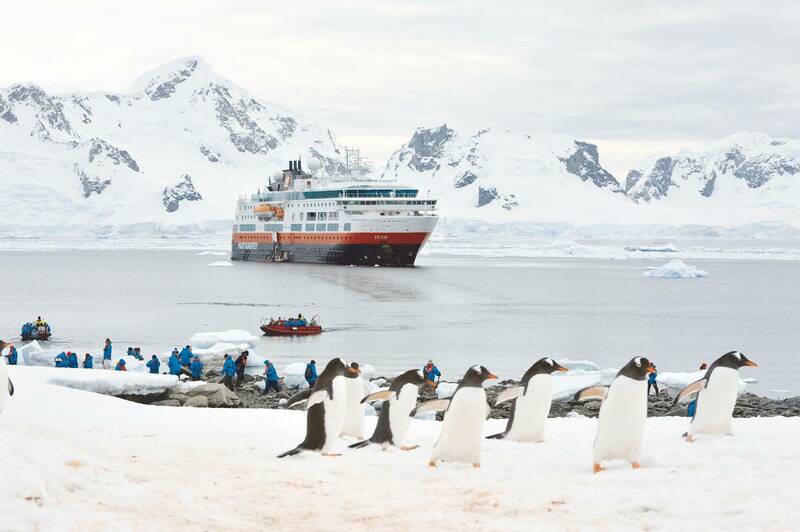 With 12 ships and the M/S Spitzbergen on the way, 2,300 employees and new cruise destinations that include icy Spitzbergen-Iceland-Canada and ritzy Amsterdam-Lisbon, creating a consistent brand experience while “becoming a world expedition (cruise) leader,” are Hurtigruten’s stated goal. “It’s quite a tall order,” she admits, but since British investors via local entity Silk Bidco AS bought the company up in 2014, the new Norwegian managerial team has made visible improvements. In a nod to its Norwegian administrative director, ordering a cruise, for one, now looks as easy as booking a flight on Norwegian.com: enter desired port of call and end destination. Voila! Hurtigruten’s Web design teams have done the rest, so travelers can chose a slice of any non-stop tour. All Hurtigruten coastal vessels are in continuous operation, night and day. With its core aim of becoming the world leader in exploration travel, this expedition cruise operator would seem to have to shout louder than the formidable marketing machines of the very large cruise ship operators with over 10-times the staff and passenger counts. For Hurtigruten, it’s a strong but niche brand versus the new trend aboard ocean giants to be “first at sea” – to entertain in myriad new ways that include virtual parachute descents and indoor snow. Hurtigruten’s aces (apart from glacial descents and real snow) are a recruitment base largely accustomed to working by or on the sea and a pedigree for moving worldly travelers, cargo and locals that arcs back to 1893. Staff, then and now, have had to speak one Scandinavian language plus English or German. To fight for its market share, Hurtigruten has offices in London, Hamburg, Paris and Seattle. The German sales staffs have been central to the company attaining a turnover of about 3.5 billion kroner. 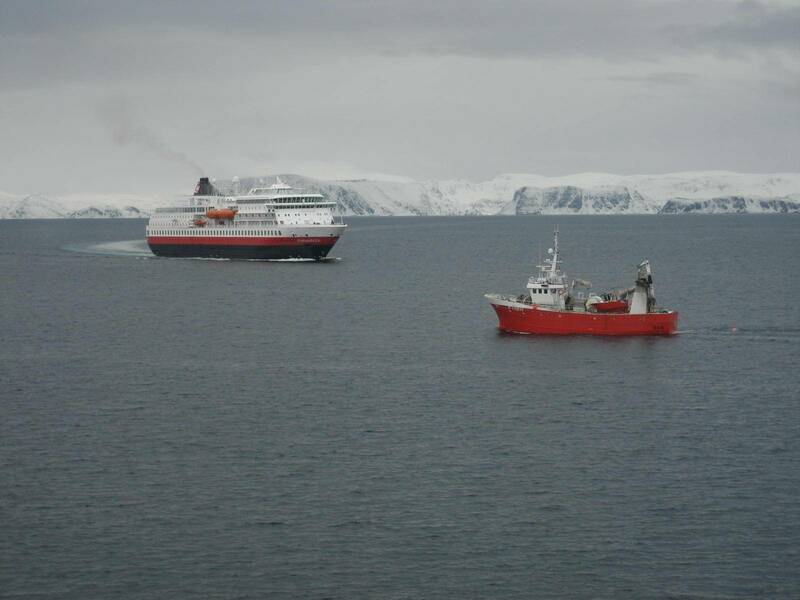 Hurtigruten’s U.S. Northwest office is also key to the drive to recruit and manage Arctic and Antarctic expeditions with the explorer ship M/S Fram (soon to be joined by the M/S Spitzbergen). For these, there are positions open, as we write, for an expedition coordinator and leader. “We hope to find this person internally, already in one of our fleet teams, we don’t know for sure,” says Joern Henriksen, product manager, Explorer. Friendly on the phone, Henriksen – who was working closely with HR to fill the Explorer Leader role – tells us the right person would have to be “able to fish … a real leader. 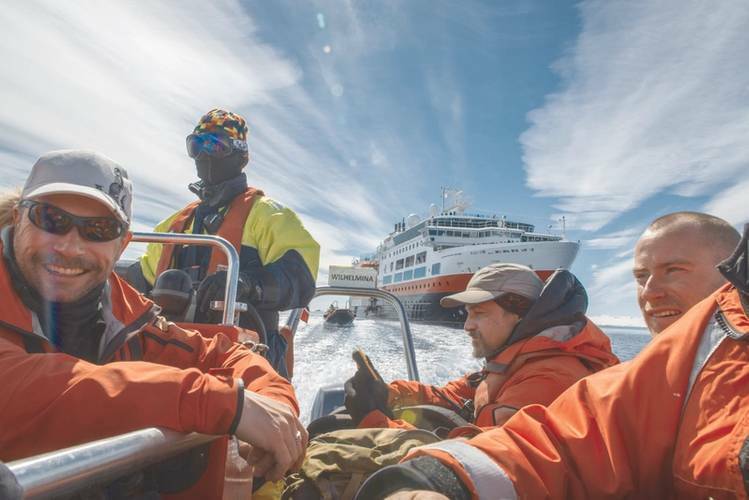 All hiring is geared toward that.” The expedition coordinator might still be found in Seattle or Canada: unlike other Hurtigruten job ads, this one’s in English. The lucky soul would likely be aboard the M/S Fram, the Lofoten, the Midnatsol (Midnight Sun) or a new vessel set to arrive in the summer of 2017. “We need someone who is flexible given the variety of tasks,” Henriksen says. “An open, extravert who communicates easily with guests, is structured and can maintain operations with third parties (including Hurtrigruten adventure outfits) shore-side. It might also be in their scope of work to have to maintain (satcoms) with hotels, transport – someone from the (marine) business.” Judging from the from the job ads we read and destination information, other roles might also have to master crafts such as rubber inflatable boats, kayaks or canoes as well as crowd control. Hurtigruten has been in the United States for “a few years now.” A little office in New York was moved to Miami before settling in Seattle, “a cruise industry hub and starting point for cruises to Alaska and to the polar regions,” Henriksen says. To that end, Finnanger and the new company leadership have started building Hurtigruten Academy, for now a virtual school and a type of intranet for learning that’ll launch in December 2016. “It’ll be our learning platform to ensure we’re attractive as an employer and to help train our people to deliver on the expectations of our customers.” The land and shore “campus” is to make online systems, communication and learning accessible. With ships growing larger to be more profitable, it is hard know Hurtigruten’s financial future. The company has survived with government help for years but is turning a new leaf, one marked by profitability and independence. Still, its journey brings it into the realm of the global giants, and staying competitive might mean adopting some more of the trappings of say, Norwegian Cruise Line Holdings’ of Florida, with its “contemporary and luxury” market dominance. That said, an NCL vessel’s trademark “guest freedom” is mirrored in Hurtigruten’s informal gjestfrihet: The Norwegian word for hospitality is a composite of the words “guest” and “freedom”. Mimicking NCL anytime soon doesn’t seem likely: as we write, a newly furnished M/S Kong Herald (King Herald) sets sail southward from Trondheim heading for Bergen with new, sleek, metal, stone and wood furnishings. The typically Norwegian design is the start of a 550 million renovation of four 1990’s era ships. First impressions hint of an arty hotel in coastal town Aalesund (one of 34 Norway stops on an 11-day route). So while Royal Caribbean might float a giant new Harmony of the Seas for 6,300 guests, Finnanger says she hopes Hurtigruten travelers might instead seek deliberate (“disharmony”) akin to the kind experienced by a landlubber using sea legs for the first time or city feet clamoring toward a walrus colony or Icelandic hot spring. So, while the cruise giants might employ the trendy “First” mantra for first-time diversions on board ship, it’s also understandable that seeing the Hurtigruten’s “weapons-trained” expedition leaders in action might also be a “first at sea” experience for customers. “We have expedition teams that really do something for the customer experience. These leaders need the ability to make other people feel seen, heard and understood. If you can do that for your customer and for your crew, then it’s a recipe for success,” Finnanger says. The company’s Norways Coastal Kitchen project succeeded in attracting elite chefs and the best local talent by offering ingredients from the Hurtigruten route: reindeer as you approach northern Norway or lamb while skirting the fjords. Steamer scampi became haute cuisine. Asked how many types of jobs will make up the Hurtigruten experience, Finnanger finds it hard to answer. “Manning centers administer manning internally and cooperate with on board managers to ensure the right (job) profiles are on duty,” she says, adding, “It’s complicated.” But on the Norwegian coast, employees are 22 days on and 22 off. For the Antarctic and Explorer segment, people are on “longer.” Despite the sea time, Hurtigruten is regularly in the “best employer” discussion locally. Local business sources call it “an extremely solid” place to work. Finnanger was proud to report that two weeks before our talk, Hurtigruten HR hired a VP of Maritime Human Resources to solidify the people focus long-term. William Stoichevski arrived in Norway in 1999 to lead a media campaign for Norwegian green group Bellona. 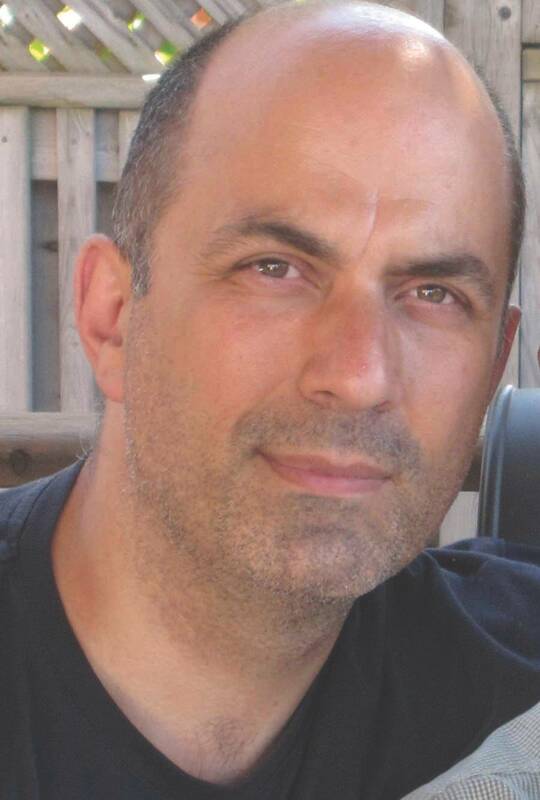 He later served as regional feature writer for the Associated Press in Oslo. In 2003, he left the AP to begin building, overseeing and writing for a number of print and electronic energy-industry publications in the Norwegian capital.